A few weeks ago, I spoke at our Student Camp in Florida. It was a great experience being on the beach with the students and sharing the Word of God with them each night. My flight left Florida on Friday morning at 7. My connection in Dallas was at 10, and I was scheduled to arrive in Texarkana before lunch. It was a great plan … but the best laid plans don’t always work out so well. My early flight was delayed two hours, so I missed my Texarkana connection. Later flights from Dallas to Texarkana were all booked. The airline said they were sorry, but they could put me up in a hotel and get me home the next day. That scenario didn’t work with my schedule. Therefore, I chose to rent a car in Dallas and drive home. I was a little bummed at the inconvenience, but it was going to be ok ... or so I thought. I am severely directionally challenged. I can’t get anywhere out of the ordinary without my GPS App. I knew my phone was dying, but figured the rental would have a USB port to charge it up. I desperately needed help in getting to I-30 from the rental car place. As it turned out, I couldn’t find the USB port (it was hidden in the console). No worries, I thought. I have enough battery to get me to familiar territory. To my chagrin, however, my Google Maps took me a back way home. I wasn’t anywhere near the freeway when my cell phone died. I looked up and found myself in the middle of nowhere with a corn field to my right. WHAT TO DO IN THE TROUBLE? Can you relate to your day falling apart with unexpected problems? Can you relate to frustrations and trials that make you want to scream? Life is like that, isn’t it? It is filled with ups and downs, good things and bad things. But here is the kicker, regardless of what may be going on in your life from day to day, regardless of your failing health, your dwindling finances, your strained marriage, your family crisis, or the fragile world situation, we have an unchanging, unfailing God who is in charge and worthy to be praised and trusted. We can choose to rejoice, even in the most difficult of days, because the God who loves us is still on His throne. He is still working “all things together for good to those who love God” (Rom. 8:28). When Job heard the news that his children had all died and his finances were gone, he still made the choice to worship and praise, even with the heaviest of hearts. The Bible says, “Then Job arose and tore his robe and shaved his head, and he fell to the ground and worshiped. And he said, ‘Naked I came from my mother's womb, and naked I shall return there. The LORD gave and the LORD has taken away. Blessed be the name of the LORD’" (Job 1:20-21). Wow! Would you join me in making a commitment to praise the Lord and rejoice in Him no matter the trials and problems? Make every day count for His glory. Live your life to please Him. Thank Him for the sunshine and the rain. Thank Him when your day goes great and when your day falls apart. Thank Him when all is well and when all is wrong. The world may not believe the Bible, but they have a hard time denouncing a radiant Christian who praises God regardless of the circumstances … and experiences His peace and joy as a result. P.S. Click here to leave your prayer request on the From His Heart PrayerWorks page and allow people around the world to lift your request up to God. Let's face it: life is filled with tough times! You and I will face difficult circumstances and impossible situations as we walk this earth. The tough times in which we live require strong faith to rise above and overcome ... and that strong faith can be yours! 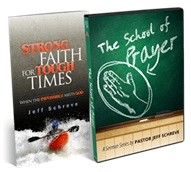 This booklet from Pastor Jeff Schreve will encourage your heart and strengthen your faith. When the impossible meets God, miracles take place!